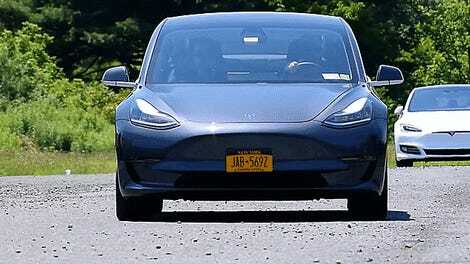 Tesla made waves earlier this week by announcing that the Model 3 scored five stars in all of the National Highway Traffic Safety Administration’s crash test categories, leading to the claim that it has “the lowest probability of injury of all cars the safety agency has ever tested.” The Tesla cars have long had a strong record for safety, but this would take it to a new level. 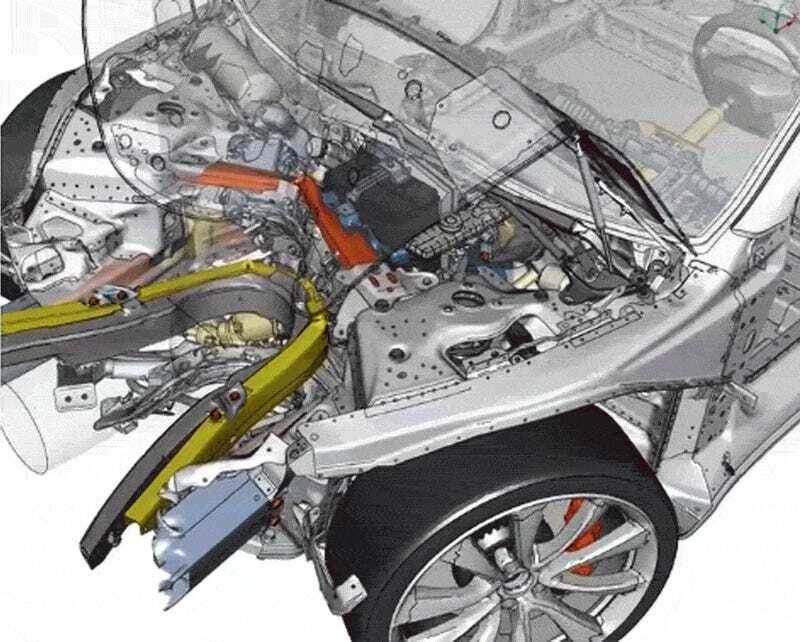 Here’s some of the engineering behind what makes the Tesla Model 3 so safe. I’m admittedly no expert on interpreting this data, but a cursory look at how the 2011 and newer NHTSA crash ratings work shows that the “p(AIS3+)” figures above represents the probability of sustaining an injury that rates a score of three or above on the Abbreviated Injury Scale, with three being “serious.” These probability figures are obtained using established risk curves relating data measured in crash tests to probability of injury. The rating methodology works similarly in the rollover and side tests (though the rollover has a different RRS vs star scale, and the overall side rating weighs the pole and side impact injury probabilities differently). So basically, when Tesla says its Model 3 has the “lowest probability of injury” ever tested by NHTSA, it means that the overall VSS score (which represents the “relative risk of injury with respect to a baseline of 15 percent”) of 0.38 is lower than that of any car ever tested. That’s impressive, any way you slice it. Since each RRS was calculated using a 15 percent baseline, Tesla simply backed out the overall probability of injury by multiplying that 0.38 Vehicle Safety Score by 0.15, yielding the number you see below: roughly 5.7 percent. Anyway, now on to how Tesla says it managed to protect the car’s occupants. The strategic placement of mass, the company says, was important. It’s not just about the low center of gravity to improve rollover protection (or the strong roof to protect the car if it does roll over) or the 50-50 weight distribution to help with handling, it’s also about minimizing moment of inertia. 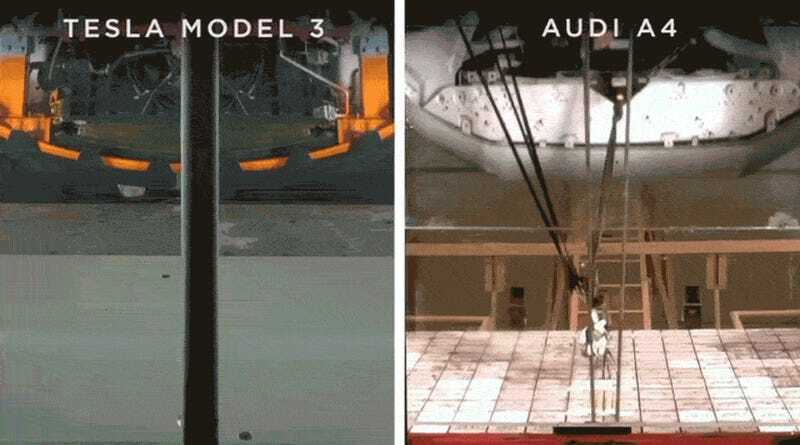 Tesla also goes on to discuss how the car’s electric vehicle architecture—consisting of a “rigid” passenger compartment and a “fortified” battery pack—helps distribute crash forces away from the cabin, and optimizes the car’s crumple zone, with the company pointing out in a video how the Audi A4's motor gets shoved toward the passenger compartment. 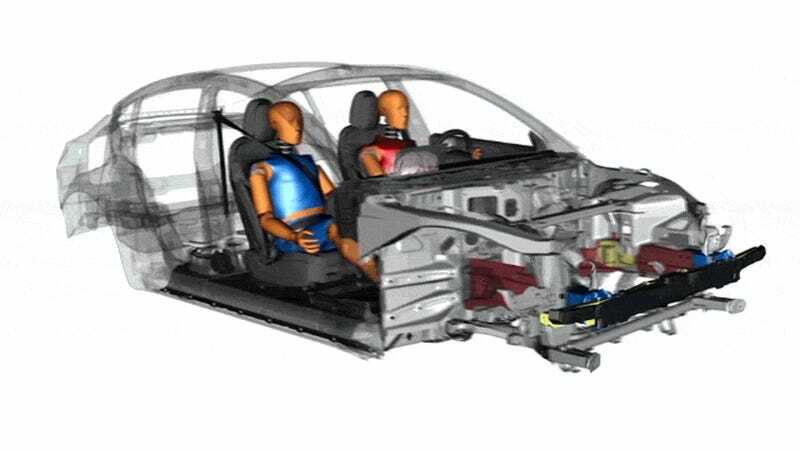 Tesla also mentions its restraint system—with pre-tensioners, load-limiters, and “specially designed passenger airbags” that protect in crashes occurring at various angles—as an important contributor in the vehicle’s overall safety. ...energy-absorbing lateral and diagonal beam structures work to mitigate the impact. This includes a high-strength aluminum bumper beam, a sway bar placed low and forward in the front of the car, cross-members at the front of the steel subframe that are connected to the main crash rails, and additional diagonal beams in the subframe that distribute energy back to the crash rails when they aren’t directly impacted. After the S, the X, and now the 3, it’s clear that Tesla has this whole crash safety thing down pretty well.